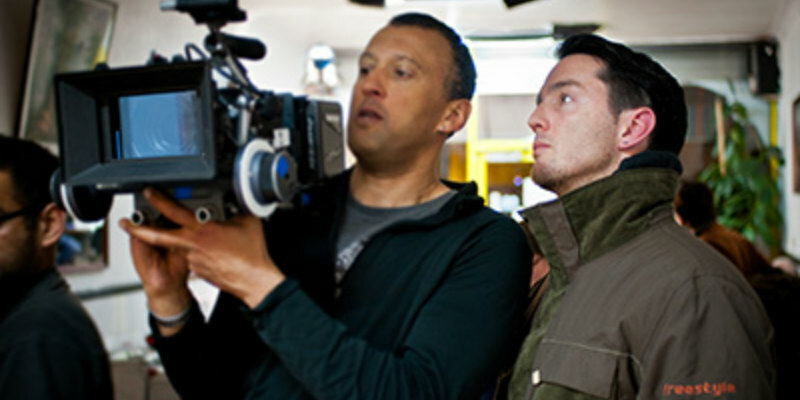 Director Keir Burrows discusses his sci-fi thriller. Keir Burrow’s Anti Matter, described by some as a sci-fi take on Alice in Wonderland, is now on DVD in the UK and gets a limited theatrical and wide VOD release in the US in September. We caught up with the filmmaker to talk about the film’s great run in the UK, comparisons to Primer, and why it’s not completely a “Wonderland” twist. How’s it going, Keir? You must be on cloud nine after getting such an overtly positive response to Anti Matter in the UK? Absolutely. Grinning ear to ear. No, it’s been very cool. The honest truth is, I really, really like our movie. I like it in an objective way, if that makes sense? I’ve made short films where by the time I was watching it with an audience for the fifth time I was like, hmm, no, no, not for me. But Anti Matter I get all smug every time I see it, I’m like ‘I made that! High-five me!’ So yes, it’s been lovely seeing people appreciating it. One thing I’ve noticed is that people seem to assume it a straight-up horror, but it’s actually more of a science-fiction piece isn't it? Yeah it’s interesting. At script stage it was pure sci-fi. I thought I was making my own little Primer or Solaris. Then as we began prepping I started bringing weirder and weirder elements in - I kind of redrafted it as very noir-ish, wanted to give it an old detective feel. Then the horror elements snuck in somehow - the whole ape mask was a very late addition to the story, then that instigated the other masks. And then in the edit, we played it up ever further. But I mean at the end of it, the root story of what has happened to Ana - there’s horror there, it’s horrifying, if you think about what she’s going through. But not boo, monster horror. Existential, you know? Jacob’s Ladder. Paranoid horror. I never once thought about it but (spoiler alert) the host at the screening at London Sci-Fi Film Festival said during an audience discussion after the showing, it’s a ghost story, isn’t it? And that made me grin. Someone seeing that, coming with that utterly wonderful insight, that I never had. Lovely. Because it is, isn’t it? A sci-fi ghost story. Would you compare it to any other movies? Primer is the first of course; that was a big influence on this project. The idea that with a smart sci-fi idea you can take no budget and spin it into something people will still want to watch. Then Memento, Moon, Another Earth were all movies I had in my head while I was writing it. Weirdly, The Prestige wasn’t, and that actually is the film it has the most similarities too, in terms of plot anyway. What goes unremarked on is the noir elements - we deliberately put a lot of old film noir trappings in. Slatted blinds, the revolver, Ana in her trenchcoat, hand bandaged, it all comes from Chinatown, and other, older detective noir films. So which of those films would you have play with it as a double feature if you were programming a drive-in? Haha I dunno, they’d all make us look very amateur I think! No for my money, because I love them, I’d say a Nolan film. The Prestige? Different enough to be entertaining, but with a similar dark soul? The story is influenced by Alice in Wonderland, right? I’ll be honest - that came later, only after the shoot was mostly finished did we start noticing all the weird similarities. Oh we played up to them afterwards, it was nice to have an existing work to link to, it helped pitch the film to distributors. Lewis Carroll was a big part of my growing up so I’m sure the influences filtered through without me intending them to. I love the weird, the strange. But it wasn’t based, during the scripting phase, on Alice in Wonderland at all. Do you need to get permission to use it as a blueprint or is it in the public domain? As before, no, because it’s not really based on Alice in Wonderland. It’s more there are some fun similarities; a girl goes through a wormhole and her world becomes weird afterwards. How did you go about getting US distribution? That was quite early, before festivals even. We approached a number of distributors who we thought would be a fit for our film. Uncork’d came on early. They’ve got a fantastic reputation and have been wonderful to work with. We’re very happy. I’d say it was all quite easy but I’m sure if you ask the producer she’ll have some war stories. As a director I just waltz around signing autographs and giving interviews, right? Has the film been modified or changed at all from the UK version? Nope, not at all. At least I don’t think so, ha, let’s see when it comes out in the US. Clearly, you’re a fan of smart scares, as opposed to just scares for scares' sake. The style reminds us of a couple of other filmmakers. How much are filmmakers like David Lynch and Guillermo Del Toro an influence? Interesting! Yes both Lynch and Del Toro are high up on my list of favourites, and both - Lynch especially, in his writing, Del Toro with his visual styling and subject choice - are big influences on me. Lynch is like Tarantino in many ways; they’re both absolute masters at creating a masterpiece of a stand-alone scene, and using dialogue like the tide, ebbing and flowing with power in a way that blows me away. We watch stuff like Twin Peaks or Mulholland Drive and reverse engineer, my wife and I pause and have big discussions about why something is working, all the work that has gone it to pulling off these strange and surreal moments in a conversation in the film that feel so effortless and work so well. Del Toro, it makes me smile that you noticed. My next film, here’s hoping, is a very Del Toro-influenced dark fairy tale horror. So fingers crossed we can chat about this in a couple years! I do love a good jump scare though, I won’t lie. When surrounded by a strong movie of course. They’re effective; if you know to expect them it keeps you peering into the shadows. That forced vigilance, it’s fun if done right because it’s so primal. Is it exciting to be getting a theatrical release in the U.S? Do you prefer audiences watch it on the big screen? Of course! Yeah, for us, a tiny, tiny film like ours, to be getting theatrical, is huge. We never expected that when making it, not at all. I love watching it on the big screen. It’s a movie-movie, you know. It’s proper, it’s not a little one-room chamber piece, it has scale, looming gothic architecture, huge machines, Gerry Vasbenter’s lovely cinematography, where he did so much with so little, it belongs on a big screen. I’ve seen it a bunch of times at film festivals in cinemas and the audience reaction is always really positive. It’s a movie to chat about afterwards as well, to discuss over a beer or a coffee. Well, that’s my hope, anyway. How different a movie would Anti Matter have been if it were made back in the ‘80s? I would have been like seven so it’d probably have sucked! No for real, I don’t know. Brighter? Films from the '80s are very bright. They didn’t use darkness well. I watched Flatliners again recently after people likened our film to that, and it’s very… eighties '80s, you know? The '80s was a fun, frothy, surface time for film. If Anti Matter was made in the '80s with no budget, it’d probably be more like Pi, like far more abstract, black and white, 16mm film, like a Chris Marker project… damn I’m seducing myself here, that sounds awesome right? Let’s do a remake! No let’s not good grief what am I saying…?